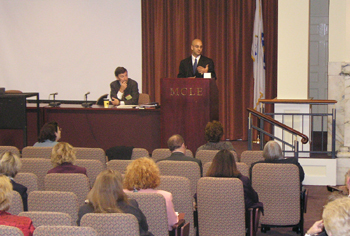 MBA President Richard C. Van Nostrand looks on as Manager of Professional Programs Peter Mina talks with section leaders at the recent orientation meeting at MCLE. More than 100 section chairs, Section Council members and officers gathered on Sept. 10 for an all-day orientation program to familiarize themselves with MBA procedures and policies and to kick off the year of new Section activity. Imagine that you are back in law school. Remember your class on civil procedure? The first time you learned how to make an objection or file a motion or how discovery works? You were introduced to new terminology such as hearsay, relevance and preponderance. Chances are you were given a criminal or civil case and instructed to learn the case inside and out, paying special attention to the "red herrings." Now imagine that you're only 15 years old. Gerry Spence is just as good a writer as John Grisham. Many of you may vehemently disagree with me even daring to compare the two. Please pardon the comparison and the double negative, but I couldn't not compare them and honestly write this review. FCBA sponsoring "Families in Transition"